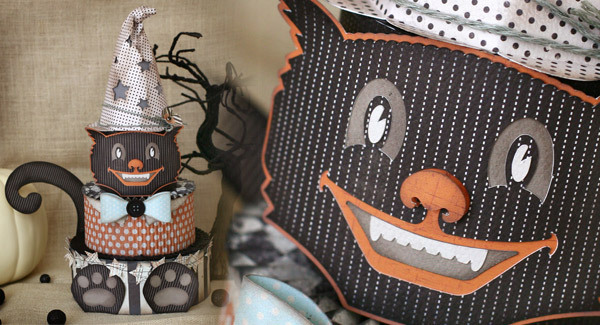 Looking for a creative way to package some spooky treats for someone? Want a fun and easy Halloween decoration? This is perfect for that! Create this to give a yummy gift, or just for yourself to sit on the table and admire your awesome work! 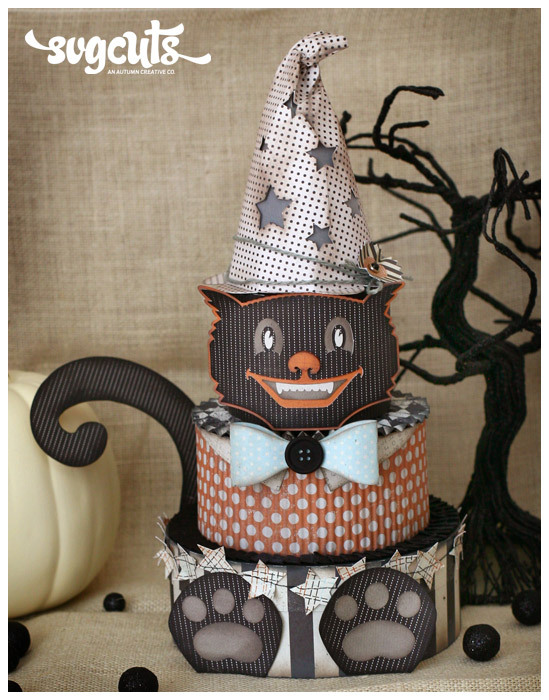 It looks great and very easy to create with just three kits! Cut and assemble the bottom box/lid and middle box/lid. In your cutting software; open file top_bottom.svg and uncheck ’keep proportions’. Right click and select ’break apart’. Size the SIDE piece to 11.50”w and 4.128”h. (Do not resize the top and lining files). Cut and assemble. Create two rectangle strips using your basic shapes library. Size them to 2.45”h x 10.00”w (With keep proportions unchecked). 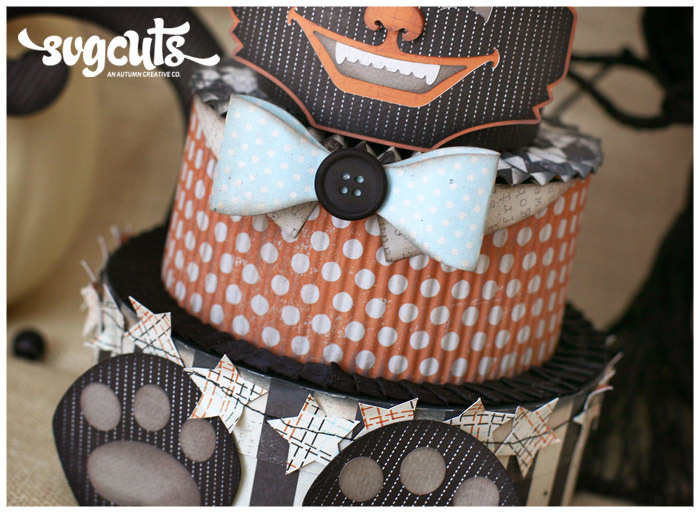 Cut with orange polka dot paper. 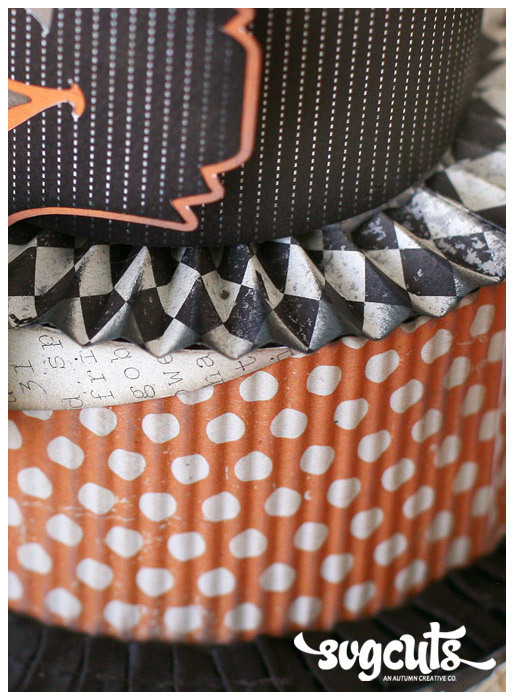 Use a paper crimping tool (Fiskars makes one) to give the paper a corrugated texture. Adhere these strips to the LID of the middle box. When the lid is placed over the bottom of the middle box the orange polka dot paper will cover the sides down to the top of the bottom box. Create two more rectangle strips in your cutting software sized to 10.00”w x 2.40”h. Using a score board, score every 1/4th” and then accordion fold both strips. Adhere ends of strips together and flatten to create a rosette. Ink edges and adhere to the lid of the middle box. Adhere the top bottom piece to the top of the middle section’s lid UPSIDE DOWN. I used some hot glue to keep it in place. I chose to make the top box non-functional, but you can easily just make a lid for it. Just make sure when you adhere the cat face, that you adhere it to the bottom part only so the lid will lift off easily with the hat attached. Cut and assemble the cat face; adhere to the top tier. I curved mine slightly so it curved nicely with the box. Open the party_hat.svg and add some random stars from your basic shapes library. 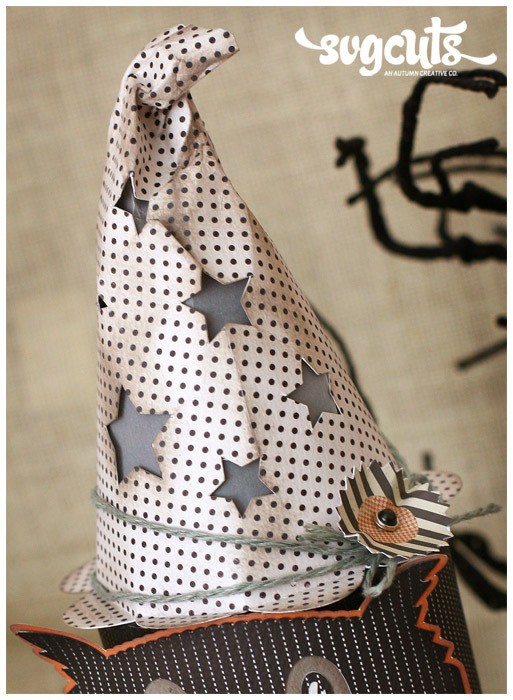 Try to keep the stars in the center as you’re going to curve the hat quite a bit to make it tall and ’skinny’. Do not ’weld’ the stars to the hat or they will not cut. You want the stars to cut so they will ’glow’ with a tealight. Once the hat is cut; trim off the ’tab’ to hold the hat together; you won’t need it. 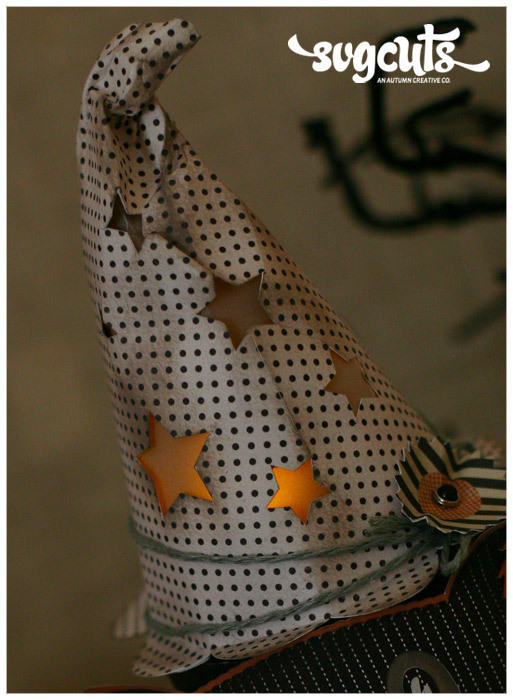 You will want to have some hot glue handy to adhere the hat. You need to do some guesswork and you roll the hat so it will fit nicely on the top tier. Once you have a nice shape to it, adhere closed with hot glue. You will then need to trim off some scallops from the back (as they will overlap after rolling that hat into a ’skinnier’ shape). Trimming off the extra scallops will give it a cleaner look and help the hat lay nicely. Insert a sheet of vellum behind the stars. When you adhere the hat to the top tier, ONLY adhere the four scallops in the front of the hat to the box. You will want the hat to ’lift’ up in the back like a little door to add in your tealight. Embellish the hat and crinkle it a bit to fold down the tip. Add gray ink to help the folds and bends to stand out. 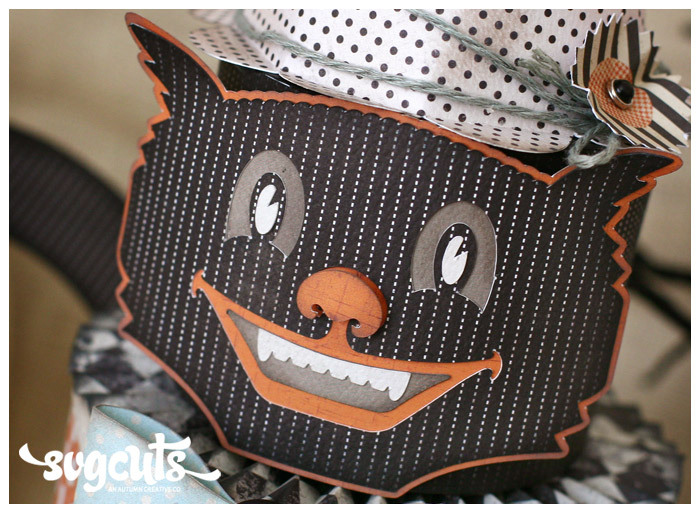 Open the black.svg and the gray.svg files from the Halloween Cuddle Characters SVG collection (Cat). Resize and ’break apart’. Only keep the black paws and gray paw prints. Cut and adhere to the bottom tier. Be sure not to adhere to the lid or you’ll glue your box shut. Open sad_pumpkin.svg and size to 9.187”w. The ’stem’ of the pumpkin is going to be the cat’s tail! You can drag the pumpkin off the mat and only leave the stem as to not waste paper and cut a pumpkin you don’t need. Before cutting, add a shadow of 6.00 to thicken it up. Once you cut the tail, adhere to the back of the bottom tier. I trimmed up the tip of the tail to give it more of a curl to it. 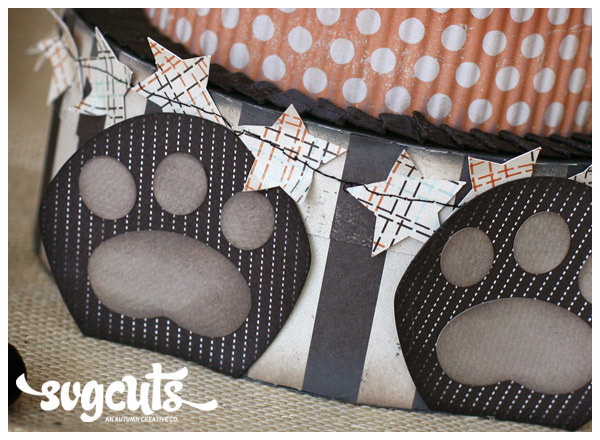 Cut 30 stars from the basic shapes library at 1.10”w and run them through a sewing machine to create a trim. Adhere around the lid. Cut the 3D bow, assemble, and adhere to the middle tier. I hand cut two triangles to make a collar. Finish embellishing your boxes with ribbon, twine, brads and a button! You’re done! Using various textures on a pretty simple project will create more interest and more to catch the eye. I knew I didn’t want to over embellish this project so I planned to use a few textures to snazz it up a bit! if you don’t have a paper crimping tool, try using various embossing folders. Ink plays a huge roll in this project for me. I used a mix of gray and black inks to ’rough’ it up a bit. The gray ink especially gives a vintage worn look to the project and helps the texture of the rosette, hat, and crimped trim to stand out a bit more. And what Halloween project doesn’t look 100 times better with some black ink shadowing added in? Try other characters! Stacked pumpkins with different faces, a witch and use some burlap, yarn, etc. 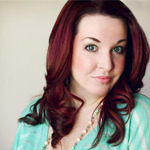 for hair! That would be darling! Not a Halloween fan? Why not try a different holiday/theme? Look through the selection of Cuddly Characters and see what you can do! Make a fun Christmas set (think snowman, Santa, reindeer, etc.) A cute bunny or chick for Easter.. you can go on and on! And these tiered boxes will hold a lot! What a great way to present some treats or a gift?! Cute and functional for multiple seasons? Yes, please! I hope I’ve inspired you and got your creative wheels turning and I look forward to seeing the SVG Cuts Facebook wall fill up with tiered boxes! *wink* Enjoy and happy crafting! Simply put – That is awesome crafty goodness! I love it!